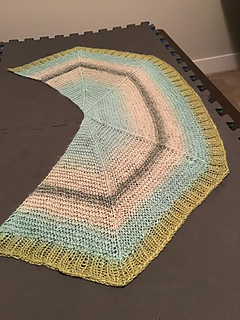 A top down shawl knit in garter stitch that can be made with a single Caron Cake (or any worsted weight yarn) using a size 8 (5 mm) circular knitting needle. 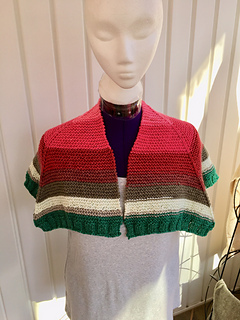 This five panel shawl features mitered squares at each end with a triangle in the center. 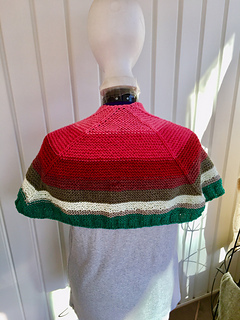 It is shaped with yarnover increases that can be knit through the back loop on the following row to close the holes or knit as usual leaving decorative holes along the shawl spines. 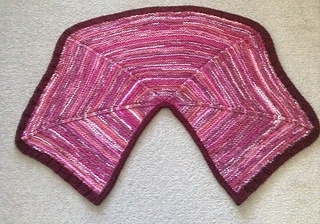 The shawl is finished with a ribbed border. Finished size is 30” along the neckline x 15” deep. 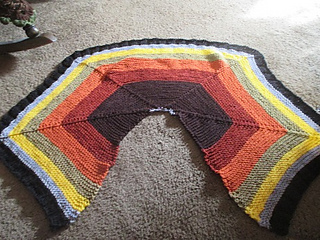 The project can be made any size using any weight of yarn by changing the needle size to suit the yarn. The three page pattern has written instructions only.